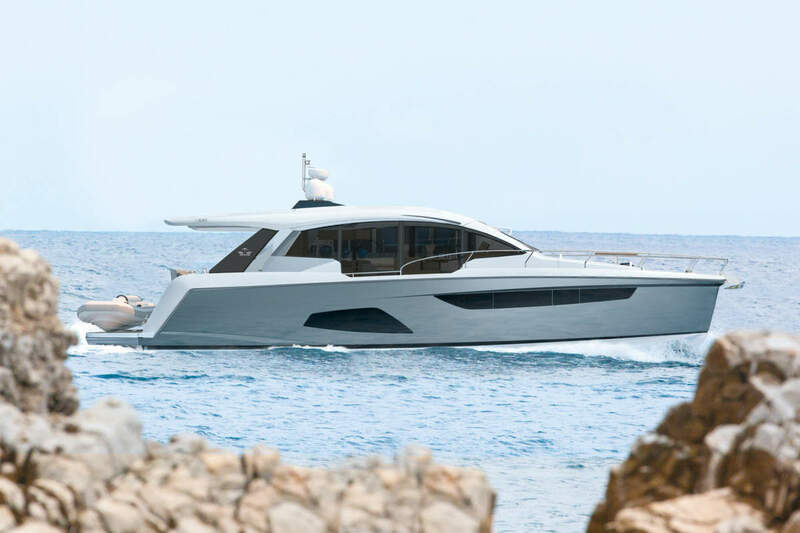 One model cannot form a range, so in 2008 Sanlorenzo launched the larger sister with the same concept of modern and mature semi-displacement hull, able to sail long range with little fuel, highly comfortable and quiet under power. SD 122, the three decked yacht built by the Viareggio yard, was awarded in 2010 by the World Superyacht Award as “best Superyacht in the 30 to 39 metres category”. Ten metres gap between the two model are too many and thanks to a satisfactory welcoming of the SD range by the market, Sanlorenzo, despite the difficult situation of the economy, decided to launch a 34 metres, the missing joining link between the 27 metres of SD 92 and the 37 metres of SD 122. 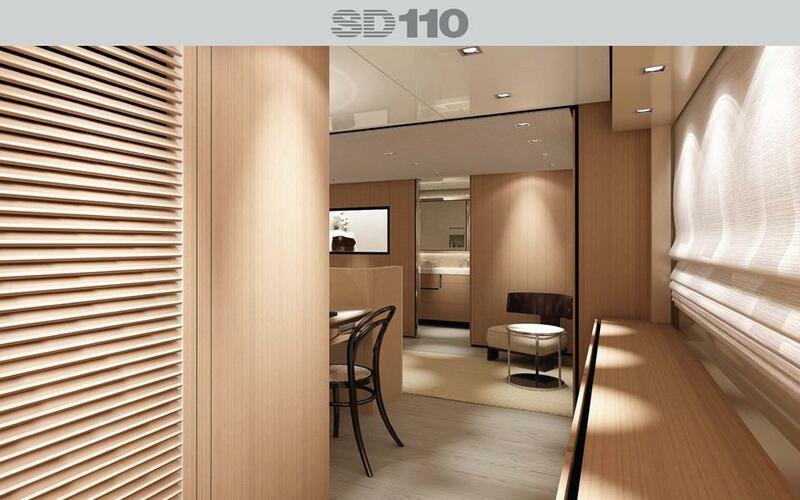 Its name is SD 110 and since the first glance the strong family feeling, the common elements of the design, the shape of the windows, in front and on the sides, place perfectly the new yacht in the intermediate space between the two previous models. 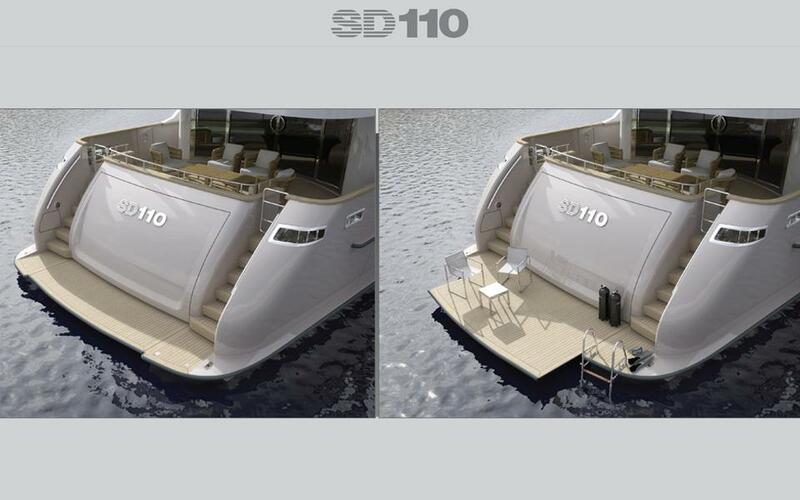 Five years after the first SD 92, the experiences built up with more than 30 SD units floating allowed to put together a number of improvements that make SD 110 a perfect yacht. Perfectly balanced in size, perfectly balanced in volumes and spaces, SD 110 summarize the qualities of both models, proposing more rather than a synthesis, the completion of a very successful range. 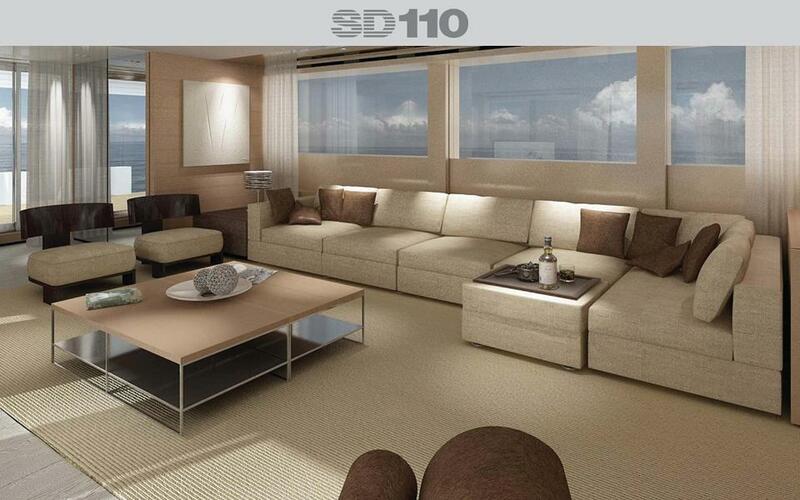 The superstructure is three decked, but thanks to sharp design tricks it has the slim look of a two deck yacht. The sun deck is very roomy and can fulfil the multiple functions of sunbathing, relaxing, bathing in the whirlpool and steering, thanks to the second helm station, as on SD 92, but with the spaces of SD 122, keeping the naval touch of the “funnel”, typical of the SD range. On the upper deck there is a semi-circular glass door you can open completely to join interior and exterior in a very huge space for a large dining room that can be inside and outside at the same time. 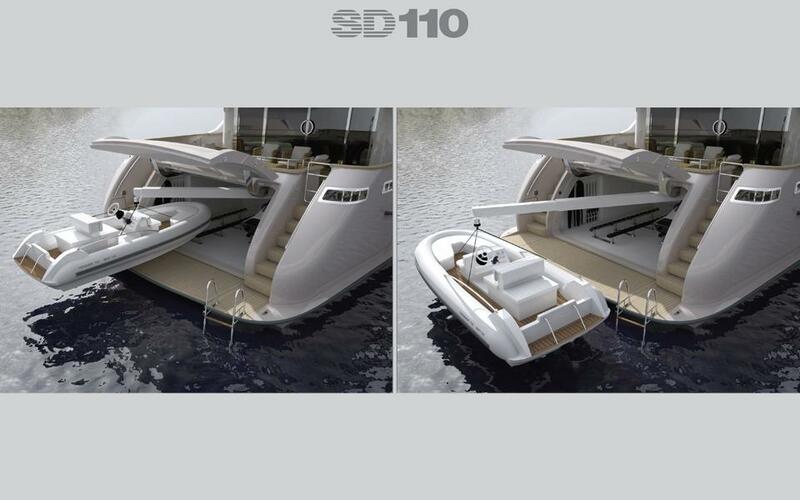 A solution of a large super yacht, for a mature clientele. 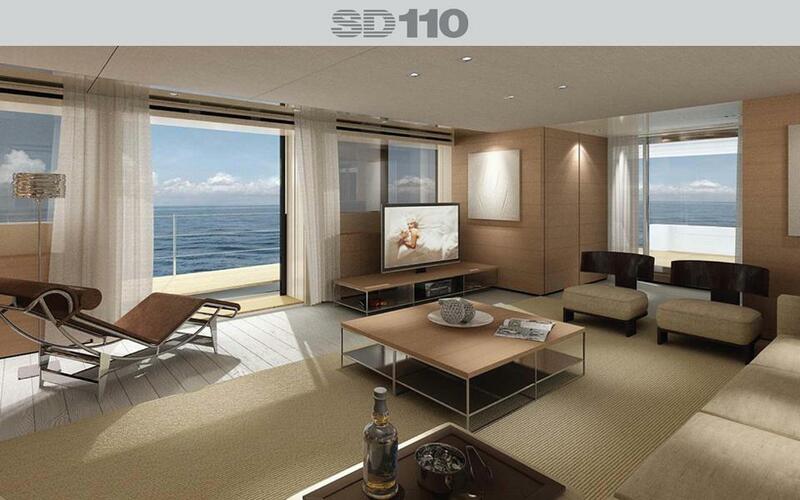 On the main deck is the large salon that can be upgraded with he optional foldable terraces, like on 40 Alloy, giving to the room extraordinary light and air. 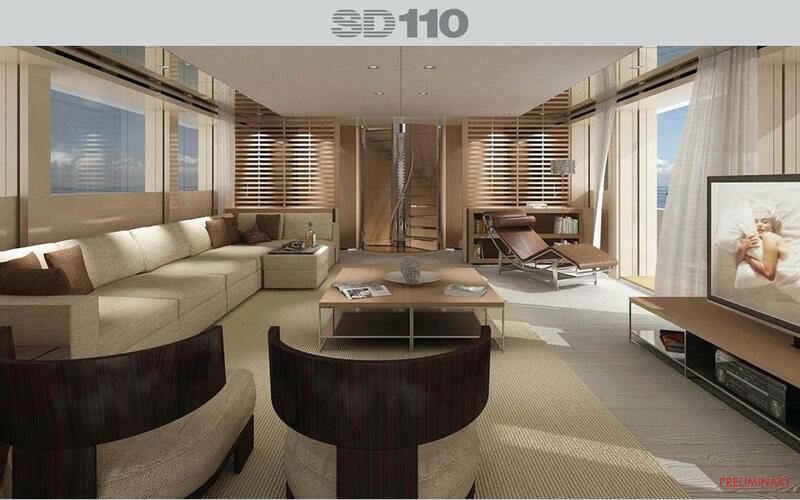 After the lobby and the staircase, where you enter through the side rounded doors, again as in a megayacht, in front there is the master cabin, with office, walk-in closet and his and her bathrooms. The lower deck hosts two double and two twin guest cabins. 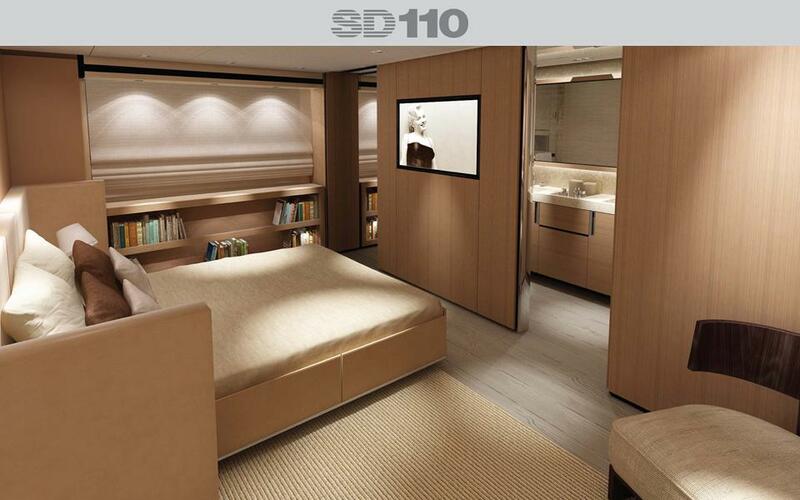 A particular solution is the perception of the round hull shape on the side of the cabins, as in a sailing yacht. In front is the crew quarter with the captain’s cabin independent. 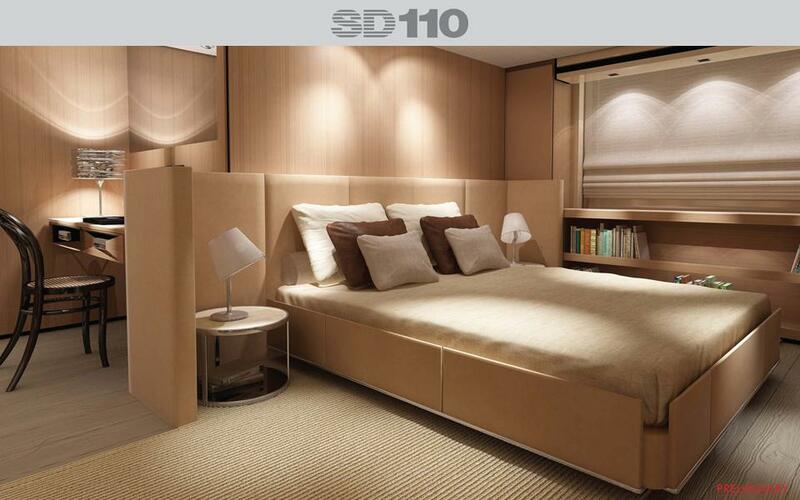 The interior decoration is strongly recalling the ship inspiration of the SD series and on SD 110 you can choose among different kind of wood, from the classical mahogany to the delicate sycamore, but always inspired by the spirit of long range, comfortable, relaxing navigation. Great attention has been paid to technical spaces, in front and aft, and to the garage to keep and easy handle all the tools for mooring, for fun, for transportation, everything always ready to use. 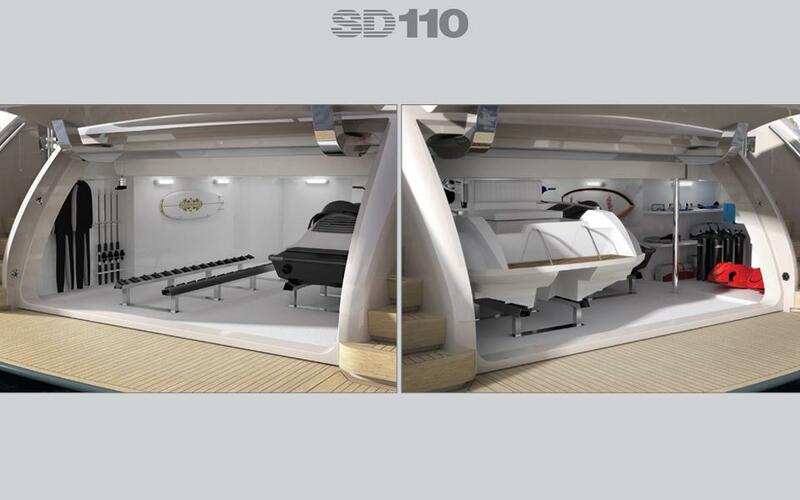 The aft platform is sliding to form a wide beach at water level, once again suitable for a 50 metre yacht, much enjoyable thanks to valid sound proofing solutions as the underwater exhausts of the gensets not disturbing he guests diving. 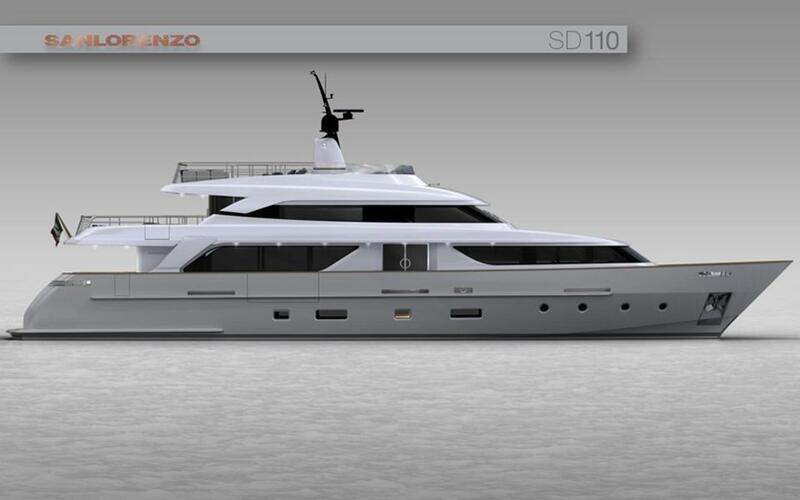 The engine room with two Mtus 12V 2000 M72 with 1,080 kW (1,470 HP) is completed by a control room, again a solution usually adopted on larger yachts. The semi-displacement hull tank tested is bulbous and allows a max peed of 17 knots, with a 2,500 nautical mile range at 11 knots, thanks to 25,000 litres of fuel and to the possibility to sail single engine. An advanced electric stabilizing system assure a smooth navigation in any condition. 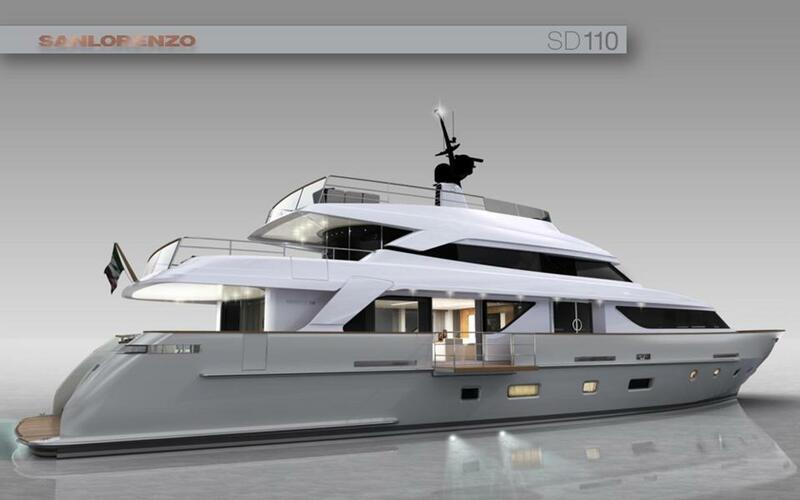 The new Sanlorenzo SD110 has a touch of finesse that establishes itself firmly within the SD line up and with the first hull delivery due in summer 2013, we at WSB think the SD11o could be a firm favourite with the Sanlorenzo faithful.